Each participant is accompanied by a companion who holds a yellow umbrella above the trance subject. 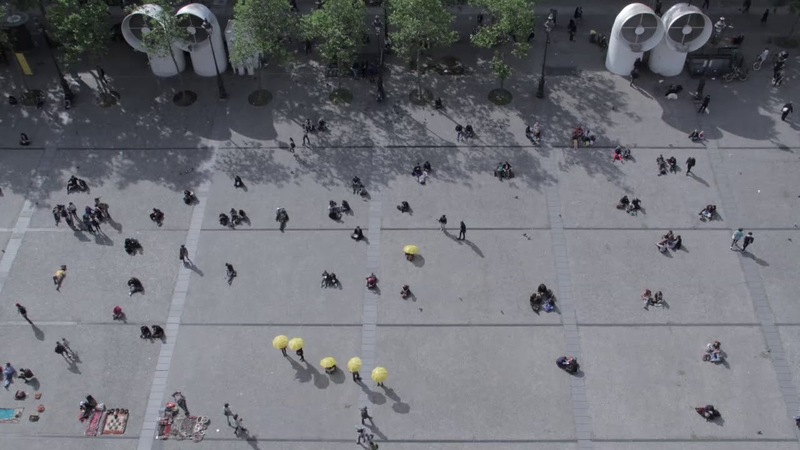 The time-lapse film from above shows how each trance participant moves across the esplanade. This shift of consciousness may remind us that humans have the ability to sense space in terms of cardinal directions rather than egocentric coordinates. The Guugu Yimithirr speaking Australian aboriginal group is a good example of this type of orientating sense, in which the expression of left, right, front and back is substituted by east, west, north and south. "When I arrived back to the U.S. I discovered that there was a community of ferrous nano-crystal based magnetotactic bacteria thriving at the lowest point of North America, in the ecologically extreme environment of Badwater Basin in Death Valley. After a long car trip out past the Trona Pinnacles and the Mesquite Flat sand dunes, I set to work on verifying the sensitivity of these micro-organisms to electromagnetic currents and how they always orient along geomagnetic or electromagnetic fields by dint of their intracellular organelles called magnetosomes. In terms of relating this to our own sense of orientation, how is it that some of us seem to have a far better sense of direction than others? On the other hand, some of us will get completely disoriented and lost whether in a city or in the wilderness. In migratory animals that travel hundreds of miles such as turtles, geese or salmon, it’s obvious that some kind of sensing relating to the earth’s magnetic field helps with migration routes so that they are able to locate exact geographic locations year after year. Research indicates (Eviatar Natan, 2017)that these magnetotactic bacteria could act symbiotically with vertebrates especially in their lacrimal glands to help with orientation sensing. So, once I had familiarized myself with the magnetotactic bacteria and conducted further research on magnetic sensing I wanted to test the possibility that humans may have a dormant magnetic sensing mechanism in the ethmoid region of the head, which is between the eye socket and the back of the nose. The idea is that secretions from these special ferrous bacteria stimulate an ophthalmic nerve and thus send information through to the host's brain about the earth's magnetic field. I organizeda performance with a cross section of the general public on the esplanade of the Centre Georges Pompidou and invited them to listen while wearing headphones to a hypnotic induction, which allowed them to tap into their own unconscious direction-sensing signals, while moving around the esplanade. The induction was designed to elicit emotive states and thus tap into the tear glands which, at least in birds, have been understood to help with orientation sensing, by allowing these feathered creatures to actually 'see' the magnetic field fluctuations on their corneas, due to the alignment of the bacteria as they flow along the surface of their eyeballs enabling the sunlight to polarise across them. The whole day was spent with participants wandering around the esplanade, some following rigid and determined vectors, while others meandered in a kind of Debord-like‘Dérive,’ eyes half open, led by their noses. With the Centre George Pompidou and the Galerie Alberta Pane. Guy Debord developed this mapping strategy in 1956, in which participants would wander through the city and "let themselves be drawn by the attractions of the terrain and the encounters they find there. "(Debord, 1956)"